In our remarkable age of instant information and photography online, Pinterest is an amazing and useful tool. There is an incredible amount of information for ideas involving flower selections, color palettes for clothing and décor plus many other useful tools Pinterest offers to help a couple select their personal tastes. Working with a wedding designer/planner who helps couples create a ‘design board’ focused on their event is of enormous help in the planning stages of any wedding. It is not always easy for brides to hone in on exactly the look & feel that she wants to create, so the usage of professional guidance with photos is extremely helpful. Having a degree in design is very helpful in planning and creating any special event….and the value of Pinterest is to be cheered! I’ve used Pinterest to work with multiple couples. There’s a collaboration tool that let’s people work on a board simultaneously. By using this, I get an idea of what the couple want their wedding to look like. Not only do I collaborate with brides, but I also have numerous boards for my couples to follow and see. I pin trends, color palettes, place cards, bridal gowns, and more. IYP caters to couples from all over the world! We’ve planned destination weddings for couples from New York, New Jersey, Tennessee, Connecticut, Utah, and California. But for the first time, Amsterdam. Simone and Alexander are a young couple from Amsterdam who wanted their wedding in South Florida. Their one request was that their special day be by the beach. IYP took their requests and got to work right away. We worked with our lovely couple via Facetime, Skype, email, telephone and text message to find out exactly what they were looking for regarding their wedding location and style. Given the budget, we needed to do some negotiating with our vendors, but we eventually made it happen. This couple never would have been able to source all the elements & vendors involved without an experienced and talented wedding planner. In fact, many websites are not available in Europe for couples to view. We secured the beach (long in advance) with a permit from the county, and provided décor and seating for the ceremony. We rented a small room in a local restaurant nearby (Oceans 234) for their private reception (overlooking the beach of course) where we integrated the color scheme of navy and pink with all the décor elements involved. The entire destination wedding party was so excited to be celebrating the wedding in the U.S.A.
Click here to see more pictures from Simone & Alexander’s wedding! Choosing a venue can be hard for many clients. There are so many places to look at and decide on. Many clients are attracted to private venues. Private venues include museums, historic locations, private mansions, farms, stylish buildings, and so much more. What attracts clients to these venues is how unique they are. Country clubs and hotel venues cannot compare to how a private space shows. These unique venues are amazing for pictures because the scenery/building style is beautiful. They also allow guests to have their own privacy as they are exclusive. These reasons may convince future clients to choose a private venue over any other place. But, what many clients don’t know is that besides paying for the venue space itself, they will have to pay for a lot more. Here’s why: Everything must be brought in when renting a private venue. That means bringing in one’s own tables & chairs, table settings, barware and perhaps a bar as well….besides the florist, catering company with service staff, entertainment service and everything else imaginable. Private venue owners are concerned with providing their venue period. They may provide a beautiful space with a lovely chandelier, a dressing room, or even a cute bathroom, but nothing more than a list of recommended vendors (who usually pay a price to be on that list). This is where full-service catering locations differ from private venues. For instance, hotel or country club venues accommodate their guests with service staff, meals, chairs/tables, cutlery, plate ware, and so much more. Clients will usually spend less money here rather than a private venue. It is so important for clients to know what they are getting into when they select a private venue, as this will determine how much you will need to spend on your special event. Some people rely on family and friends to help plan their wedding. Here’s the reality; your family and friends are NOT wedding planners. In fact, your friends have a life of their own and their personal lives can get in the way of planning your special event. That is why you need to hire someone whose only job is to help plan your wedding. I can guarantee you that a wedding planner will put you, your loved ones, and the wedding as their number one priority. The best thing about professional wedding planners is the fact that they know what they are doing. They help take care of invitations, picking out a design/color scheme, making payments to vendors, and so much more. There are things that could possibly go wrong at a very undesirable moment, but no worries! Your wedding planner is there to take care of any situation that could possibly happen minutes before your wedding. Some people worry about the cost of hiring a wedding planner. But what many people don’t realize is the fact wedding planners are always on your side. They work with your budget to make sure you get everything that you want on your special night. Planners receive wholesale prices and should pass the savings along to their couples. Believe it or not, you will spend less with a wedding planner as opposed to planning a wedding on your own. Professional wedding planners have the ability to make good deals. They have experience doing that from previous weddings. In fact, they will not stop until you get what you want. They also have connections with multiple vendors that could be used during your wedding. If you plan your wedding on your own, you will not know which vendor to choose or which one gives you the best deal. Wedding planning isn’t easy. There are so many little details that need to be considered and done. Couples that plan weddings by themselves will realize that planning such a huge event can be very stressful and exhausting. They may even begin to argue in the process of planning. That is why it is important to hire someone who will help organize and plan everything so that you and your family don’t have to stress over it. So relax. It’s your special night. You should be 100% present at your wedding. Hiring the right and professional wedding planner will make your wedding amazing and stress free! This article was written by Myrna Swire. Myrna Swire is a professional wedding and event planner since 1998. She has won numerous awards including The 2016 Best of Boca Raton Award in the Event Planning category. If you or anyone you know is having a wedding or special event, please contact Myrna Swire. Below are some photos of my happy clients. There is a lot of appeal to having a summer wedding. Summer months offer many discounts from vendors and venues because it is down season. As well, there are many holidays (Independence Day, Memorial Day, Labor Day) that will provide days off from work and perfect timing for guests to travel and for a couple to celebrate their nuptials . However along with a summer wedding can come a few hurdles. Luckily for you, if you follow these tips and tricks, those obstacles can be easily avoided! 1. Think About Fabrics Using clothing that is lightweight and airy will be well appreciated come your wedding day. Fabrics such as chiffon or silk dresses or linen suits can do wonders for keeping the bridal party cool while still looking formal and chic. 2. Cooling Down the Guests One way to prevent your guests from overheating is to give out fans before the ceremony. These fans can be personalized and can even double as wedding favors. They are a cute way to keep your guests cool and everybody happy. 3. Updo hairstyle When considering what kind of hairstyle you want to rock on your wedding day, take into consideration the weather. More often than not, an updo is a classic look that will not be affected by the climate. Not only does keeping your hair up limit the effects of humidity, but you also don’t have to worry about hair sticking to the back of your neck as you say your vows. 4. Indoor/Outdoor Venue In case of bad weather, it is smart to consider a venue that has an indoor space in case you need to bring the festivities inside. Picking an outdoor area that is independent of a physical structure, such as a park or the beach, can leave you with not plan B if it starts to rain. Always prepare for undesirable weather when planning an outdoor wedding; you wouldn’t want all your well-spent money to go to waste. 5. Natural Shade If your wedding budget doesn’t allow for tents, one way to avoid making your guests sit in sunlight is to utilize natural shade. Large trees are a natural canopy from direct sunlight and create a beautiful backdrop for any wedding ceremony. 6. 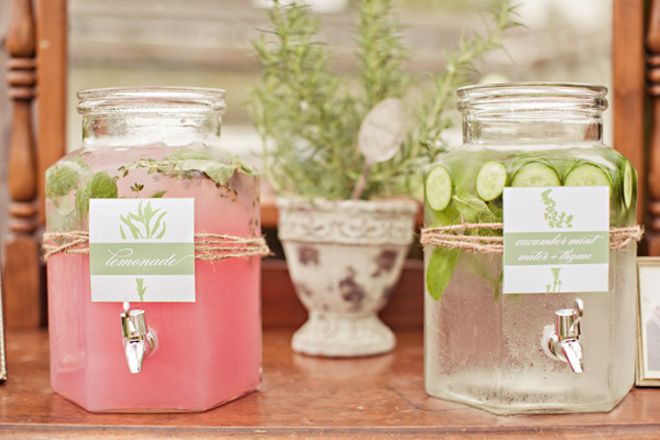 Keep Your Guests Hydrated Guests are likely to get thirsty during any wedding ceremony, especially one during summer. Do them a favor and supply them with water before it begins. Either offering water in jugs filled with lemons or other fruits, or giving out water bottles with custom labels, are a good addition to any summer wedding. 7. Wedding Favors Take advantage of the season when planning your guests’ wedding favors. One great idea, especially if you have a beach themed wedding, is to give out flip flops to your guests. They can wear them at the event and keep them afterwards. Flip flops can be personalized to say the name of the Bride and Groom and/or the date of the wedding. Other ideas include personalized beach tote bags and sparklers. Held at a boutique resort on Singer Island, the vibe of this wedding was Palm Beach meets South Beach, as most of the guests were from up north or Miami. And, we had the perfect backdrop to this couples wedding weekend. The ceremony in white took place at the hotel’s gazebo overlooking the ocean. At sunset, the cocktail hour was held at the nearby five star restaurant on property overlooking the ocean deck. The sheer fabric enclosed dinner reception under a canopy tent consisted of long and round dining tables in white with gold linen and chairs, simply stunning white floral embellished with jewels and personalized menus and bon bons to match. The surprise after-party continued inside the hotel ballroom featuring the wedding cake, DJ with crowded dance floor, hi tops and private furniture alcove area….all in white and gold. The wedding continued through the magical night. Why hiring a Professional Wedding Planner can save you money. In today’s world everyone is finding ways to save, even when it comes to planning a wedding. With the many wedding expenses, from catering to venue to florals, some young bridal couples attempt to plan their own event. They don’t realize, however, how much time and money they can save by hiring a professional wedding planner. A professional wedding planner is trained and experienced in coordinating all the details of your event to your specifications while sticking to a budget. With today’s hectic lifestyles, many bridal couples and their families do not have the time or resources for the detailed planning that a beautiful Wedding requires. By utilizing the expertise of a seasoned wedding planner, you can save yourself a lot of time and run-around. Hiring a professional wedding planner is like having insurance for your wedding: your planner is with you every step of the way, ensuring the vendors are reputable, the decor and entertainment are fabulous, and that you remain within your budget. At It’s Your Party, we have longstanding relationships with the vendors that we recommend. Thus, we are able to negotiate discounted prices and pass the savings along to you. With outstanding service and personalized style, It’s Your Party can save you time and money when planning your wedding. Read more about the finance side of planning a wedding with Myrna Swire’s interview on Bundle.com.